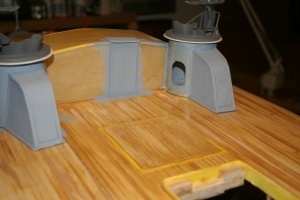 The Higgins PT model I am building is of the earlier series and it is based on the Al Ross plans for the PT 265 class. These boats were originally designed with torpedo tubes, but many had the tubes replaced with “roll off” torpedo rack/launchers before deployment or in the field. PT 305, the boat being restored by the WW2 museum in New Orleans is of the 265 class, but in the field carried roll off torpedoes and gradually increased armament including the 20 mm, 37 mm, and 40 mm cannons typical of the late stages of the war. I do not know whether the PT 305 ever had torpedo tubes installed at the time of construction, as PT configuration changed and evolved continually and rapidly during the war. The 265 class was an intermediate stage in the evolution of the Higgins PT boats. Because the boats were originally designed to carry torpedo tubes, the gun turrets were attached to the cabin at the aft corners and had short tails extending aft. Once the tubes had been abandoned and the roll off racks were being installed on boats during construction, the gun turrets were moved aft about 30 inches to improve visibility from the cockpit, and the later boats had extensions from the cabin tho the turret and still maintained the short tails aft of the turrets. The plan is for the model to have working torpedo tubes that launch working torpedoes. The tubes are being fabricated using 1 1/4 “thin wall PVC pipe, the type used for under-sink drain pipes and the torpedoes will be launched with a compression spring. The torpedoes will be pushed into the tube, compressing the spring and held in place with a pin extending up through the forward pylon holding the tube. When the pin is retracted by servo action, the torpedo should launch. 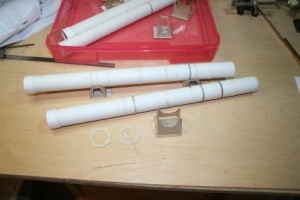 The torpedoes are fabricated from lengths of 1” PVC water pipe with turned wooden head and tapered tail. 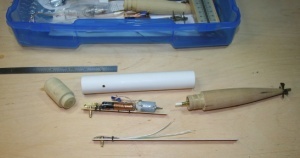 The propulsion system is a small electric motor, which just fits in the plastic tube, two AAA batteries in series and a switch that is held open by a pin extending through the wall of the plastic tube. When the torpedo is in the tube, the pin is pushed upward and the switch is open. As the torpedo leaves the tube, the pin drops down and the switch closes, starting the motor. In developing the switch, I made up several prototype knife switches of brass using elastic bands to provide the closing mechanism. These worked but were too tall to work well in the small space available, so I converted to a switch of spring steel, which has a lower profile and seems to have solved the problem of space. In the photo, you can see the component parts of the torpedo, one of the initial prototype drive units, and the “new and improved” switch. At present, I need to fabricate the four torpedoes, get them painted and sealed, do some buoyancy and water testing, then see if they will launch from the tubes as planned.